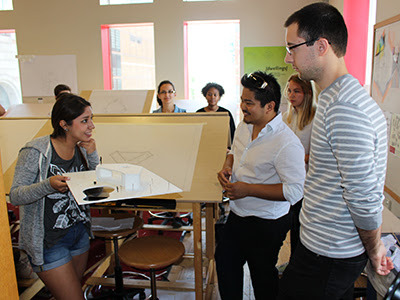 The BAC recently bid farewell to its 2015 group of Summer Academy students, who spent four weeks on campus and throughout Boston exploring architecture and design. The participants, high school students entering grades 10 and above, spent the past month building fundamental design and critical thinking skills through sketching, creating models, mapping, presenting, and working together in teams. At the end of the program, students had worked with new materials and discovered new ways of observing and envisioning the world around them, using Boston as their urban laboratory. "One of the program's goals is to challenge students to solve engaging problems," said Summer Academy Director Henry Miller. "If we can help the students develop critical thinking through solving problems in a creative way, then we have given them something that will translate across disciplines. Not everyone who attends Summer Academy will be an architect or designer, but whatever they do, they will now have the skills to work their way through a challenge." The students participate in a wide variety of activities and projects during their time in the city, each week sharpening a new set of design skills. They explore Boston's neighborhoods and make observations through sketches and models, perform a mapping exercise, and build models, all while considering the comfort and functionality of spaces for guests, residents, and passers-by. The students even undergo their first series of design reviews from guest reviewers—the first review session of many more to come if they decide to pursue a career in architecture and design.